If you’ve uploaded files to your Google drive, you may notice that you can’t edit them until they’ve been converted to a Google document. Why convert to a Google document format? Converting a file to Google Docs format allows you to edit, collaborate on, and share a doc online. 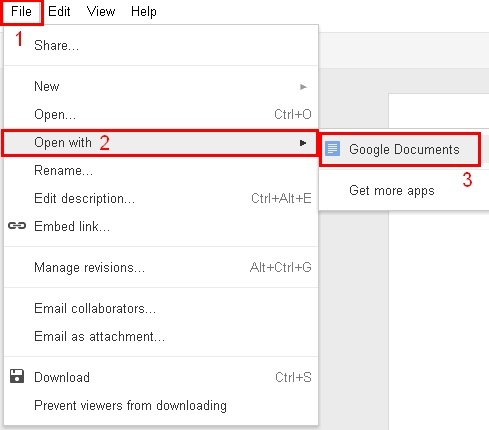 You can decide to convert a file to Google Docs while you upload it or after uploading it. Google Drive gives you 5 GB for your synced and uploaded files. However, Google Docs and files converted to Google Docs format don’t take up storage space. How do I convert a file to a Google doc? First, open the document and click on “File”. Second, click “Open with –>” and third, click “Google Documents”. This will convert the file into a Google doc, which you can edit, share, or collaborate on. This creates a separate document from the original, so the original will still be in your Google Drive list if you need to access it.